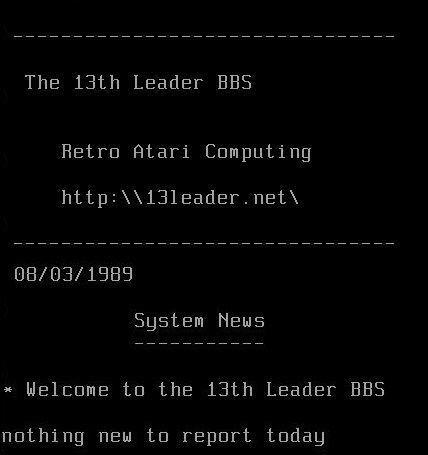 13th Leader is a reboot of an 8-bit Atari 800 XL BBS from back in the late 1980’s! Originally hosted out of Hamilton Ontario Canada! Back in the 80’s we ran on 8-bit “Home Grown” BBS software and 2 5-1/4″ floppy drives. Still hosted on a real 800XL Atari computer with A.P.E. to emulate disk and modem peripherals. Note: Our 8-bit demo only has one node. Only one user can access the node at a time. If you cannot connect, some other user could be connected. Go have a coffee and try again later. Better yet, as you wait – visit http://13leader.net for Atari info, great Atari content and our main Atari discussion BBS! $ telnet 13leader.net 6502 * Demo 8-bit BBS Express on a real 800 XL Computer! Goto http://13leader.net for more info and other Atari content! Connect to Thirteenth (13th) Leader BBS (8-Bit Demo) Now! 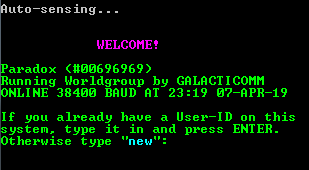 This BBS is using a non-standard telnet port (6502), the web telnet script may not work.